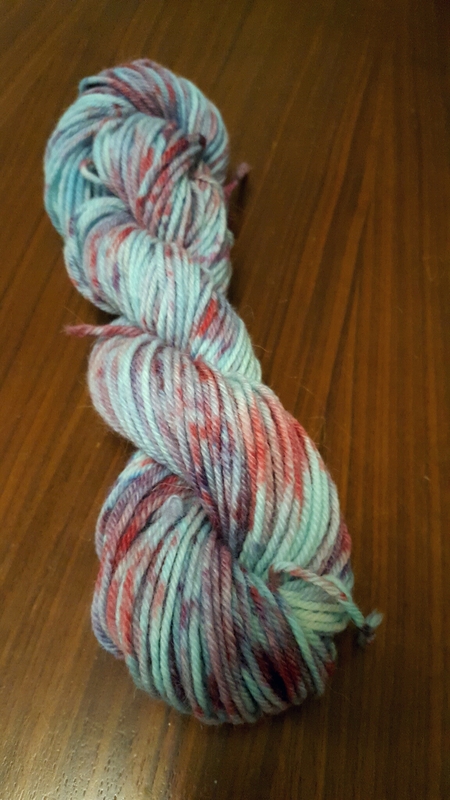 I dyed this yarn using Wiltons gel food colour. We also dyed this. This is Drops Lima – I thought I could get my partner involved – allowing me to try 2 different methods using the same base ingredients! 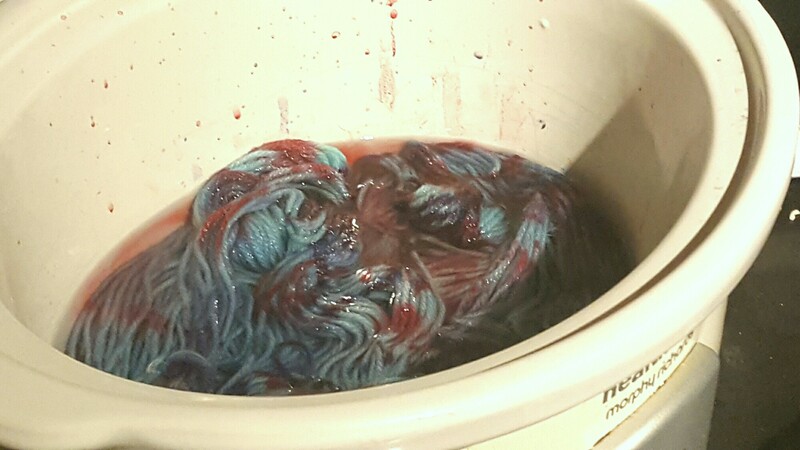 We started by soaking the yarn in luke warm water then submerging it in a light dyebath (which consists of water, food dye and a liberal glug or 10 of vinegar). 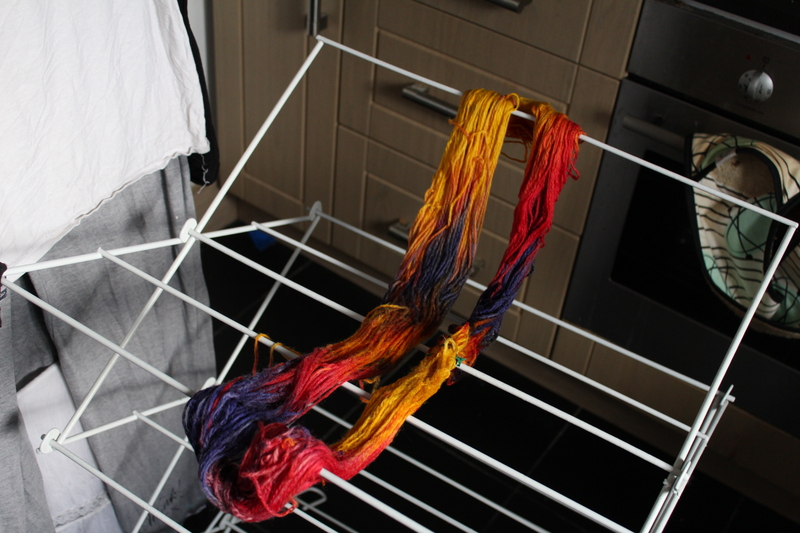 We soaked the chunky wool in a dyebath on the hob. 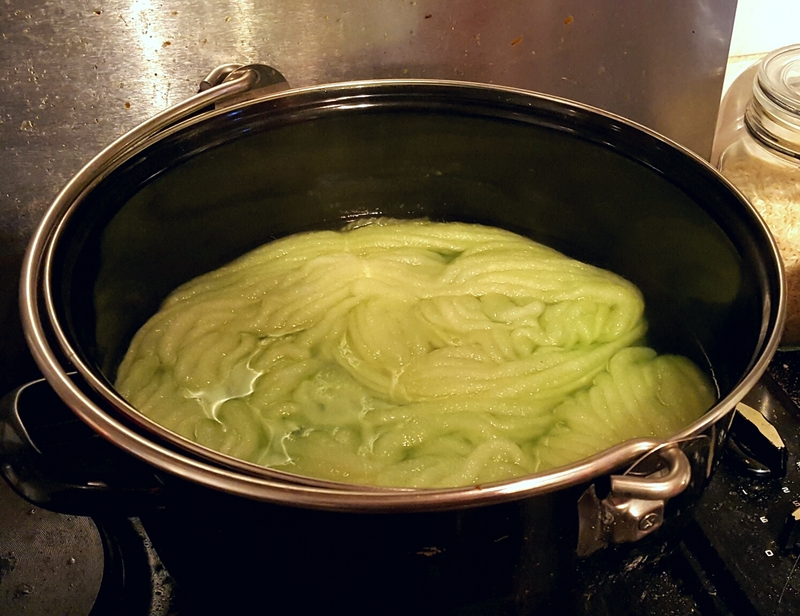 We soaked the lima yarn in a dyebath in the slow cooker. Once they had soaked up all of the dyel we took them out and pressed out any excess liquid. 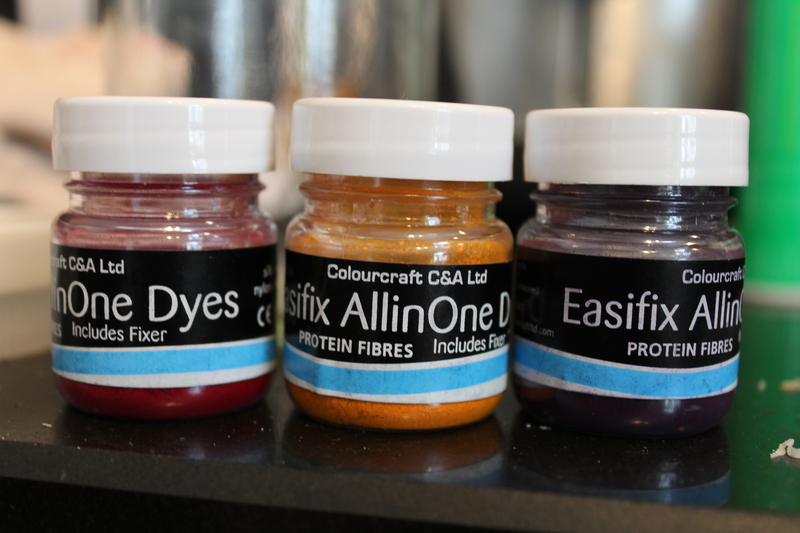 We made up a couple of little pots of dye using the wiltons food colouring. This is where the process changed a little for the 2 yarns. 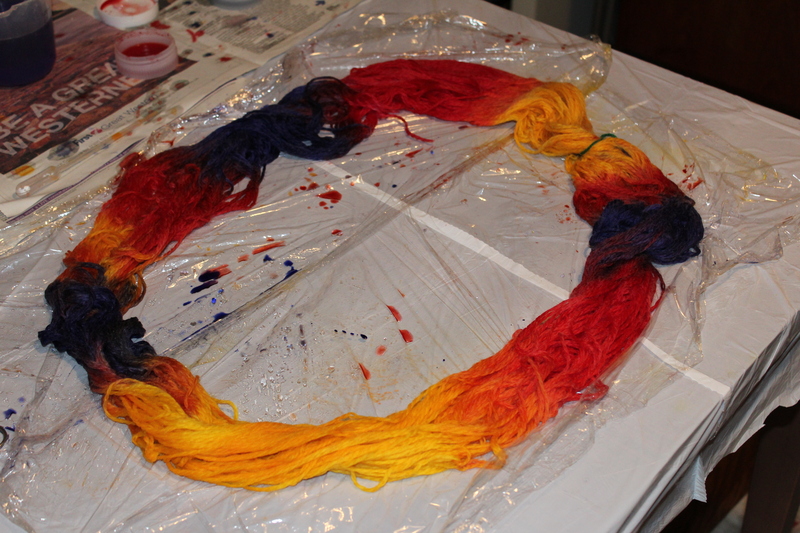 For the wool yarn, we laid it out on a sheet of cling film and dropped the dye directly onto the yarn. We then wrapped it up into a parcel and placed it into a steamer basket and steamed it for around 45 minutes. 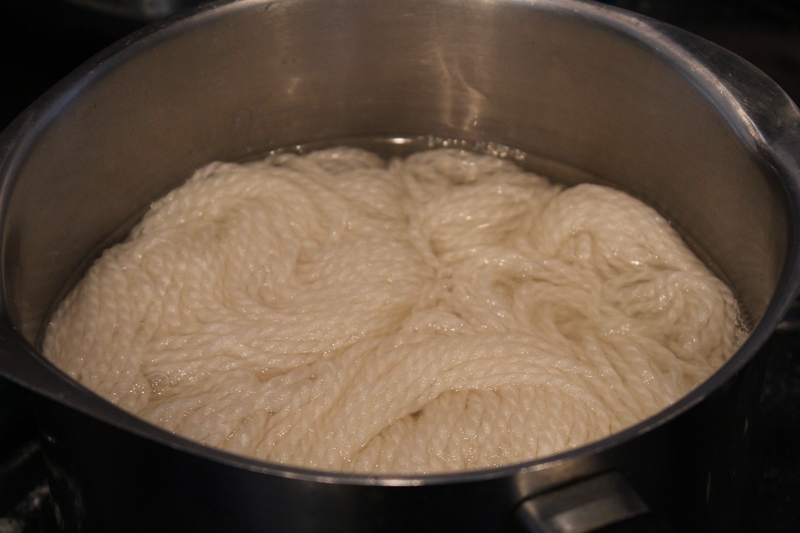 For the lima yarn, we drained the water from the slow cooker then added just enough water and vinegar to cover the yarn. We then used a pippet to apply small amounts of dye all over. Once more, we let it sit with the lid on until the liquid in the dyebath ran clear. Then all that was left to do was rinse and lay out to dry. 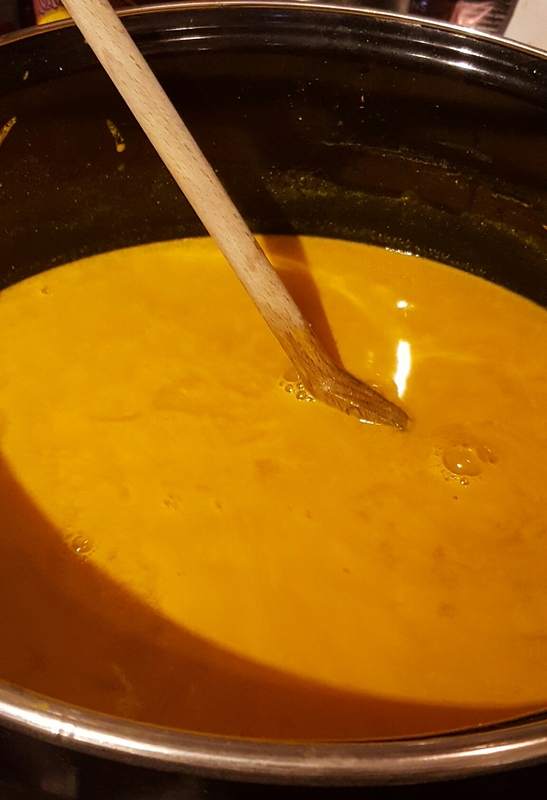 Pros: As with the turmeric a big benefit to this method is how food safe it is! I only have a very small kitchen so I dont have the space for extra pans and utensils just for dying. Another pro is that there is no horrible smell left on the yarn after. Cons: There arent too many cons to this method. The only one that I can really think of is how badly it stains your skin and your surfaces if you arent careful! Also, you may be able to see in the picture that my moorlandy yarn has a little bit of dark blue in it. I did not use blue dye. This is actually the black dye – so I guess if you wanted black, this wouldnt be the dying oprion for you. As you may remember a few blog posts back I shared with you some scrummy Welsh wool that I had bought on etsy from the lovely Charlies Angel Fibres. Well, here is my first attempt at dying a skein. I was actually planning to try dying with Kool Aide, which I had purchased back in October, but when I got down to business, I couldnt find them for the life of me, so I decided to try one of my other planned methods instead. 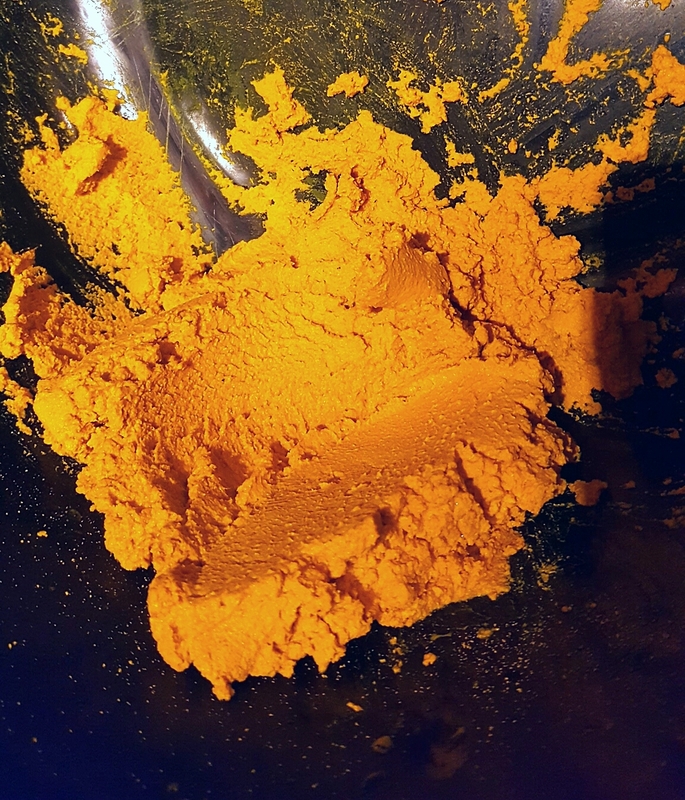 Natural dying, using Turmeric. First of all, you need to soak the yarn. As it was wool, I had to be careful not to agitate it too much. I dont want it to felt after all! Then its time to make the dye bath. 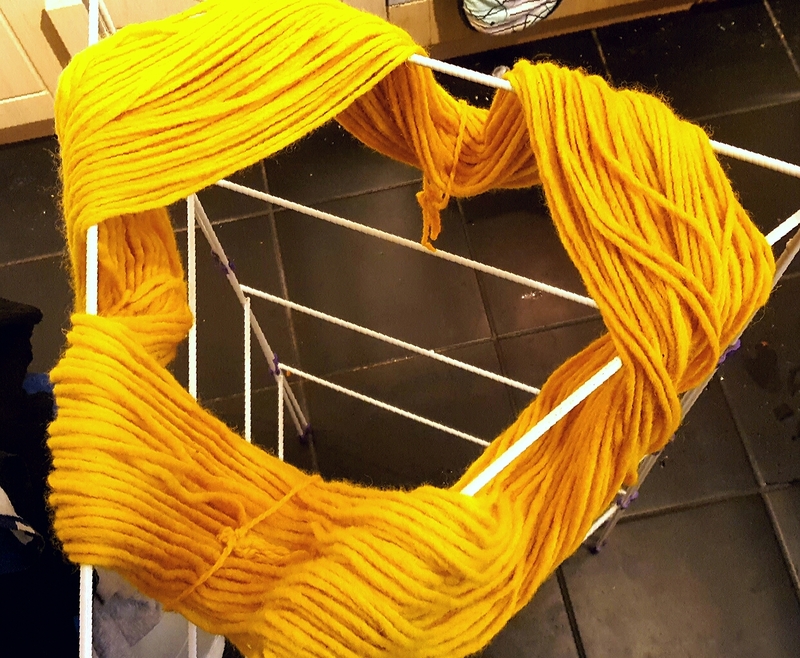 As I was dying a chunky 200g skein, I made up a larger dyebath, using 6 tbsp of turmeric, a good glug of white vinegar and 6 pints of water. 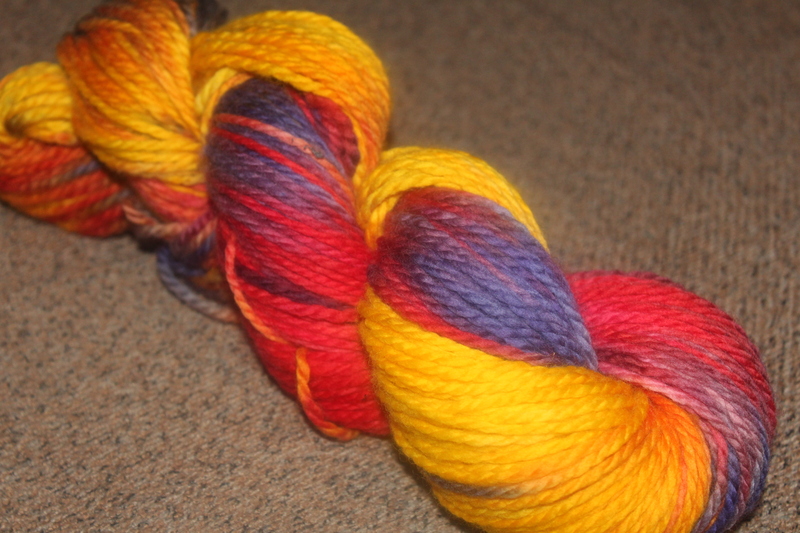 You could probably half that if you were only dying a 50g or 100g skein. First I placed the turmeric and vinegar in a pan. The amount of vinegar used should be enough to form a soft paste with the turmeric. Then I mixed in the water and brought to a boil. After that I dropped the temperature and let it simmer for around half an hour. At the end of the half hour I turned the hob off, allowed it to cool just a little so it was no longer bubbling, then placed the yarn in the pan. If it was a cotton yarn, I would suggest leaving the hob on when you put the yarn in, and continuing to simmer for a half hour before you turn the hob off, but as my yarn is 100% wool, the movement of the simmering bubbles would agitate the yarn too much amd felt it.so for wool, you need to wait until the liquid is still. 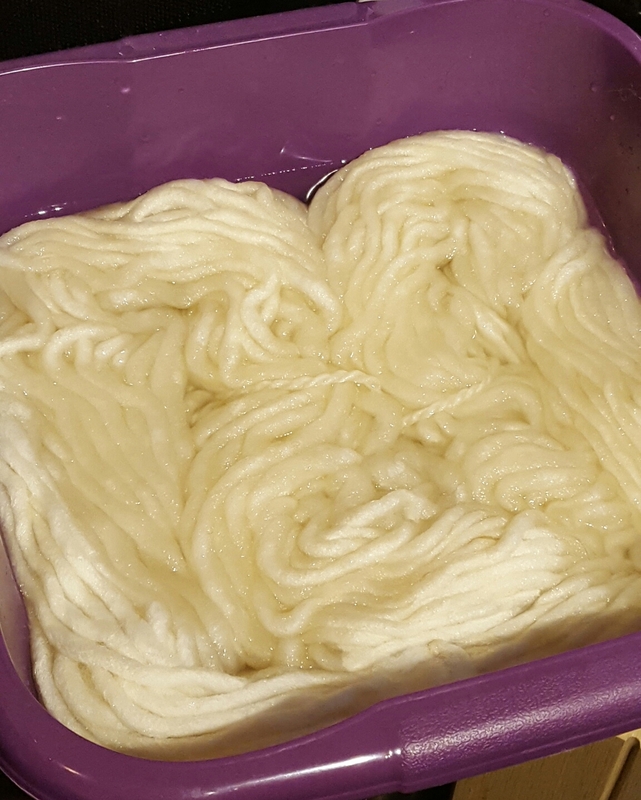 After you have placed the yarn into the dye bath you should just leave it until the liquid is cool. A couple of hours is great. Now it is time to rinse. Again, as I was using wool I had to be quite gentle at this stage. Rinse it until the water runs clear. Then squeeze it to release and evess water. To get the most water out, you can lay it down on a towel and roll it up then press it or stand on it. Now it is time to admire my newly made yarn! I dont know what I want to do with it but its beautiful. Pros: Being food safe is a big pro! I love that it is just natural ingredients, because it means I am not putting agressive chemicals into the water supply. I also love it because it is a very cheap and easy option. Cons: The smell. It has dissipated but it hasnt gone away. Plus its dusty – by which I mean you have to let it dry then shake the life out of it – I shook it in the kitchen and in minutes my kitchen floor was yellow! Also, it kinda dyed my fingernails yellow, so I looked like a chronic smoker for a few days! 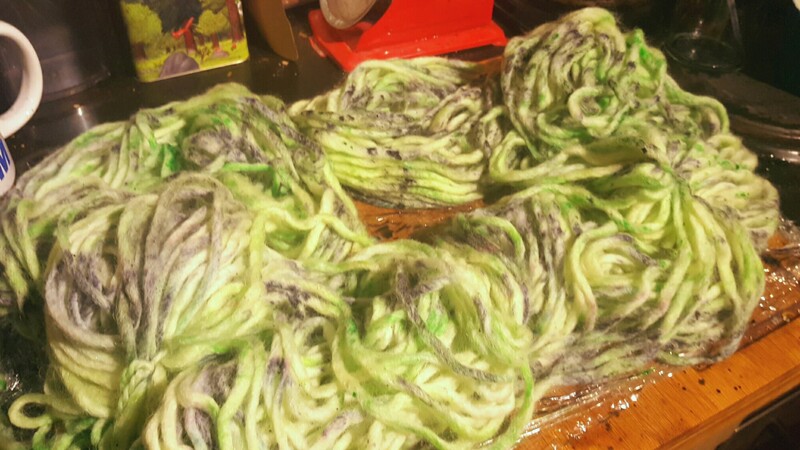 Our First Attempt at Yarn Dying!!! 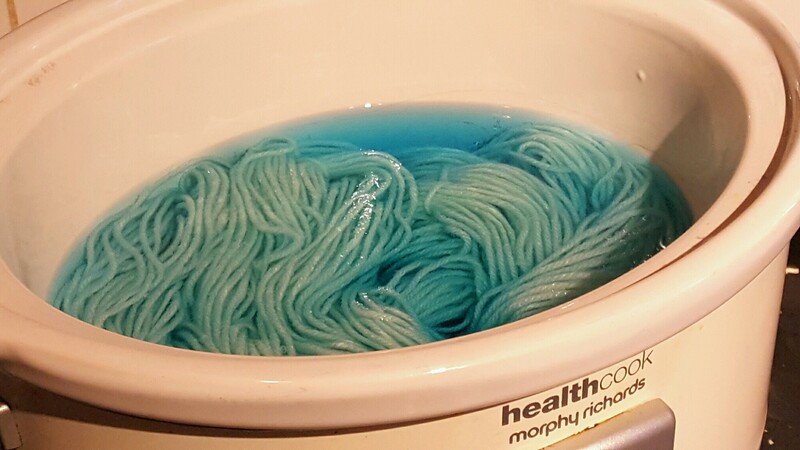 So, my other half has been wanting to dye yarn for a long time. He had been researching and planning and everything. Then we went to the spring knitting and stitching show, and we came across a stall with yarn dyes and a stall with reasonably priced undyed yarn. So we grabbed a few bits! 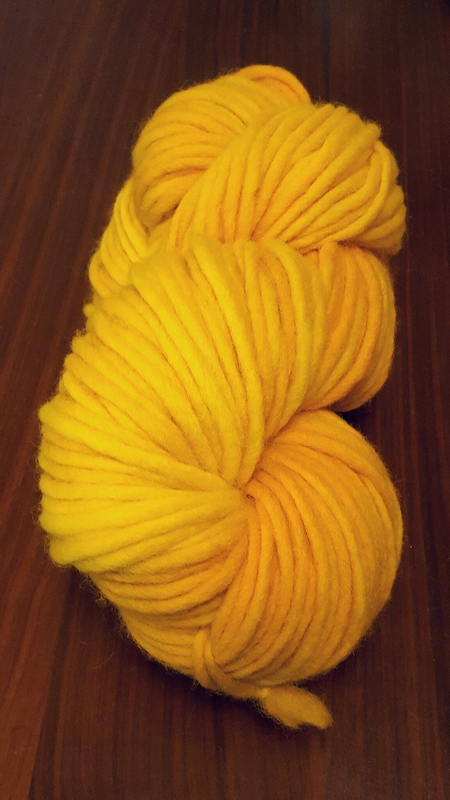 And on sunday, we did it, we dyed our first ever hank of yarn! This is how we did it! First, we turned the skein into a hank, and tied it a couple of times to keep it from tangling. We then soaked it in luke warm water for around 2 hours. Be careful here, if its too cold or too hot, the yarn will felt! You wouldn’t want that! 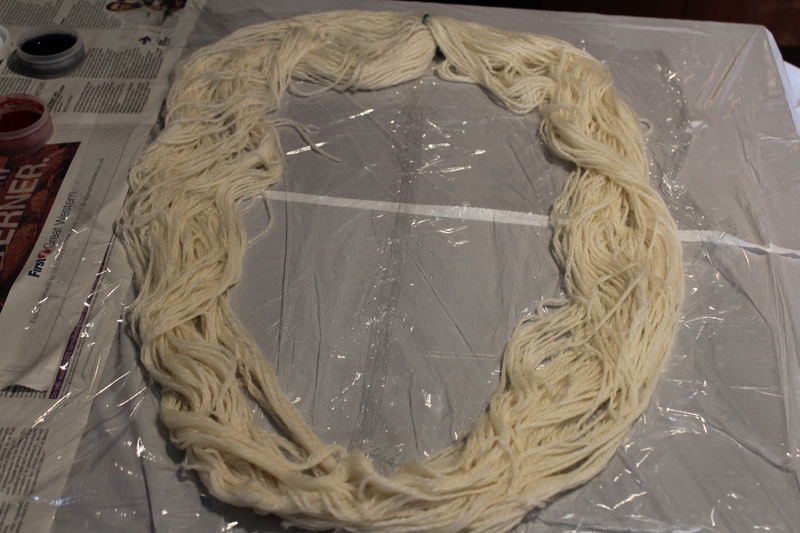 lay the yarn out on some cling film on a protected surface, ready to be dyed. Prepare the dyes. Dilute the powder with water. Obviously the colour will get weaker the more water you put in. We then applied the dyes using a pippet. This is the tricky bit. We found it quite difficult to evenly distribute the dye. And blending evenly will take a lot more practice! 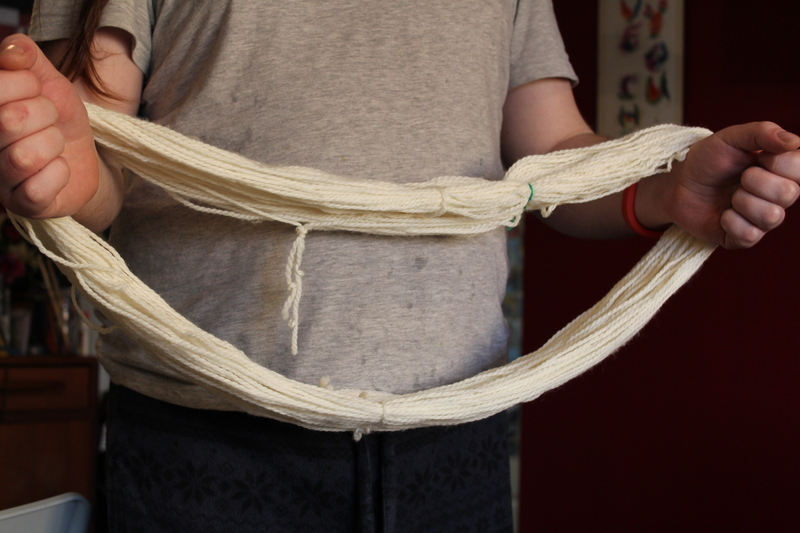 Once the yarn is fully covered, wrap it up in the cling film. 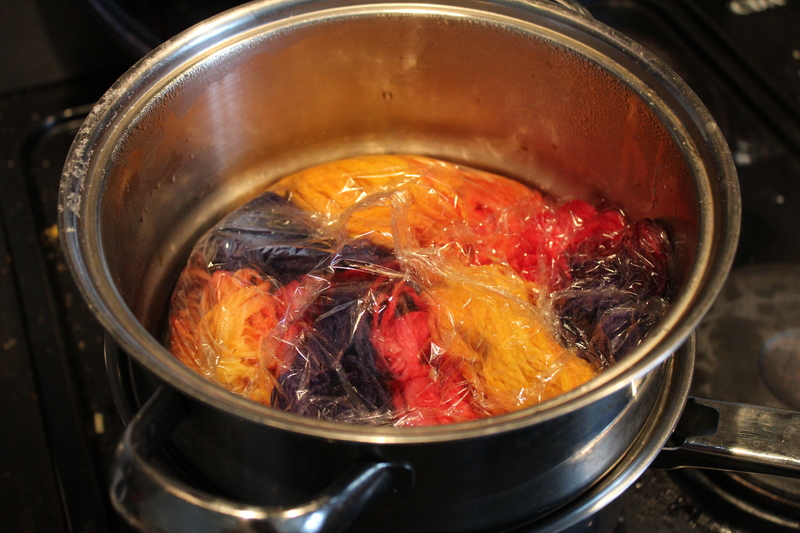 Place the parcel into a steamer and steam it for around 40 minutes, or until all dye has been absorbed. Lay out to dry. This took a while. You must make sure it is completely dry. Thats it! All done. I am quite proud of it! Its got a few slightly muddy bits where I didn’t blend well or where I overworked the dye, but overall, I think its gorgeous! Not bad for a first attempt! 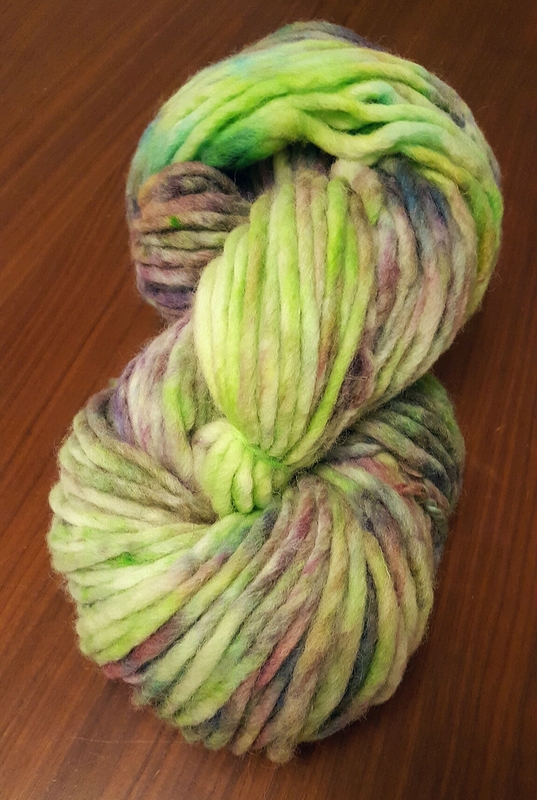 As a yarn dying newb, I would love to hear your tips and tricks! Leave a comment!